Latest excavation work in the ancient city of Çatalhöyük in Turkey has revealed the world’s first hemp-weaved fabric, which was found wrapped around a baby skeleton in the ground of a burned house. 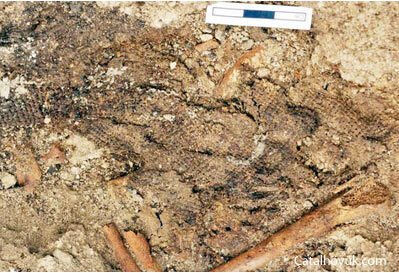 The city of Çatalhöyük is the largest and best-preserved Neolithic site found to date. At a time when most of the world’s people were nomadic hunter-gatherers, Çatalhöyük was a bustling town of as many as 10,000 people. Inscribed as a UNESCO World Heritage Site, it is known as one of the best sites for understanding human Prehistory. The linen, which dates back 9,000 years, was found as part of the latest dig, which involved 120 people from 22 different countries, and was one of the most striking findings of the season, particularly due to its high level of preservation. Hemp is a commonly used term for high growing varieties of the Cannabis plant and its products, which include fibre, oil, and seed. Hemp fibre was widely used throughout history for items ranging from rope to fabrics and even sail canvases. Hodder believes the piece of linen came from the eastern Mediterranean from the central Anatolia, and may be evidence of hemp used in trade. Hemp has been cultivated by many civilizations for over 12,000 years. However, until the latest discovery, the oldest evidence of hemp fibre came from imprints found on Yangshao pottery in China dating to the 5th millennium BC. The Chinese later used hemp to make clothes, shoes, ropes, and an early form of paper. The classical Greek historian Herodotus (ca. 480 BC) reported that the inhabitants of Scythia would often inhale the vapours of hemp-seed smoke, both as ritual and for their own pleasurable recreation. It is not known whether the inhabitants of Çatalhöyük in Turkey had discovered the more ‘recreational uses’ of the Cannabis plant. Featured image: Excavations taking place at Çatalhöyük. Photo credit . According to the Columbia History of the World, the oldest relics of our human history are fragments of hemp fabric found in tombs dating to 8,000 BC. The fiber obtained from the hemp plant has proven to be extremely durable, which is why it was historically often used for rope-making and heavy-duty canvas cloth. Hemp was widely used in the U.S. for centuries before the mid-twentieth century; Levi Strauss’ first pair of jeans was in fact made out of hemp fabric, as he found the combination of durability and comfort ideal for robust workwear. The hemp plant grows quickly and efficiently without any need for pesticides, herbicides or chemical fertilizers, making it naturally organic. Hemp plants fix essential nutrients back into the soil, making them an ideal crop to grow on land the needs nourishment. This gives it significant headway when compared to cotton cultivation, which uses some of the most toxic pesticides on the market, immense amounts of water and yields much less fiber per acre. The stem of the hemp plant contains the fiber used for fabric production, meaning that hemp belongs to the bast fiber group alongside flax, jute, ramie and kenaf. These types of plants contain the softest fibers in the inner core of the stalk, while rougher fiber makes up the outer layers of the plant stalk. Unlike other cellulose based natural fibers, hemp contains less lignin (a viscous, glue-like substance that holds the fibers together) making fiber separation relatively easy. Traditional, mechanical methods of hemp fiber processing require no chemicals, although modern, chemical intensive methods have been adopted by several Asian producers. Since hemp fibers are naturally very long, it is difficult to find machinery that will easily process and spin them into yarn, as many modern machines are made for processing shorter fibers. Once spun, hemp fiber is often blended with other fibers like cotton, wool and silk for textiles that combine the best qualities of each fiber. Hemp and cotton blends are extremely soft, wool and hemp blends are superbly warm, and silk and hemp blends create a lustrous fabric that is strong and durable. Hemp fiber displays superior qualities as a fabric, as it insulates excellently, breathes well, efficiently blocks ultraviolet rays and is often not processed with the use of chemicals. Hemp fibers are actually much longer and stronger than cotton with eight times the tensile strength and four times the durability. Other uses for hemp fiber include paper, rope, cording, animal bedding, biomass fuel and car interiors. Hemp seed is a by-product of hemp fiber production, and offers numerous health benefits when enjoyed in one’s diet. Many health food brands use hemp seed and oil in foods like salad dressings, dairy-free milk, granola, veggie burgers, protein bars, breads and crackers. Hemp oil can also be found in skin products, soaps, and household cleaners as it is a natural cleansing alternative to harsh chemicals. It’s that season for hemp advocates to network and celebrate with each other for a weekend of activism, music, speeches, comedy, food, craftsmen goods and all the other aspects of a summer festival. Seattle Hempfest is happening next weekend, August 14th-16th. Come see how seattle does it! Yuletide is a time of year for appreciation, generosity, kindness, magic, love, and all those other warm feeling moods. There are many ways to take part, I just hope that you do. Regardless of your religious & political beliefs, this is a time of year in our American culture to embrace the diversity that makes America so special. Be kind to each other. Tolerate those that are different than yourself. Display affection and generosity, in whatever ways you are able to. Spread and share in the holiday spirit. Below are some links to local ( Seattle area ) organizations and communities that reach out and help spread cheer during the holiday season. The holidays are a great reminder that we are all part of this world, we all have joys and sorrows, success and failure stories…..we all share some type of common ground.